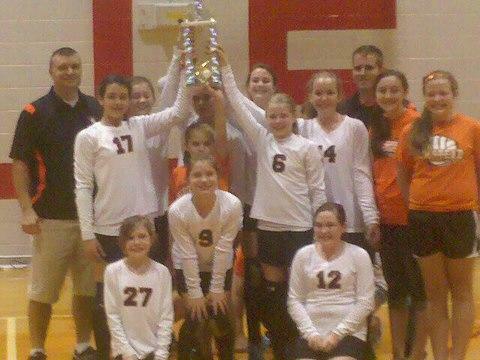 The Olmstead Lady Rams won the Logan County Middle School JV Volleyball Tournament on Sept. 22 at Adairville School. Coach Buddy Wright’s team won the championship by defeating Auburn in the semifinals 25-19, 25-17, and Chandlers in the championship 25-13, 14-25, 15-13. Members of the championship team include Jill Baldwin, Leah Crossley, Taylor Haley, Blayke Bingham, Abi Lindsey, Carlie Alvis, Evett Young, Libby Fuqua and Paige Baldwin. Three nights later, the Olmstead varsity beat Auburn in the quarterfinals and Adairville in the semifinals before losing to Chandlers in the championship game. Wright also coaches the varsity.